Business that shapes the world. Earn your MBA while gaining actual, hands-on, international business experience with the USD International MBA in under a year! While other programs may try to prepare you to work in international business, our program immerses you in foreign markets and cultures so you can experience them firsthand. Your journey starts in Madrid – Our program starts at the University of San Diego’s Madrid Center, right in the middle of an economic, cultural and political hub in Europe. You’ll focus on current business issues in Europe, discussing global business best practices and leading multicultural teams and organizations. Continue on to San Diego - Returning to USD’s campus, ranked the #1 most beautiful campus in the U.S., you’ll expand your network by joining other MBA classes and focusing on international management coursework. Courses will include financial analysis, strategic management, entrepreneurship and consulting. These courses will include site visits to companies in the San Diego and Baja California region. International consulting project – The International MBA also includes an intersession consulting project. Recent consulting project countries have included the Dominican Republic, Argentina, Brazil, Germany, India and China for companies like Walmart, L’oreal or WD-40. 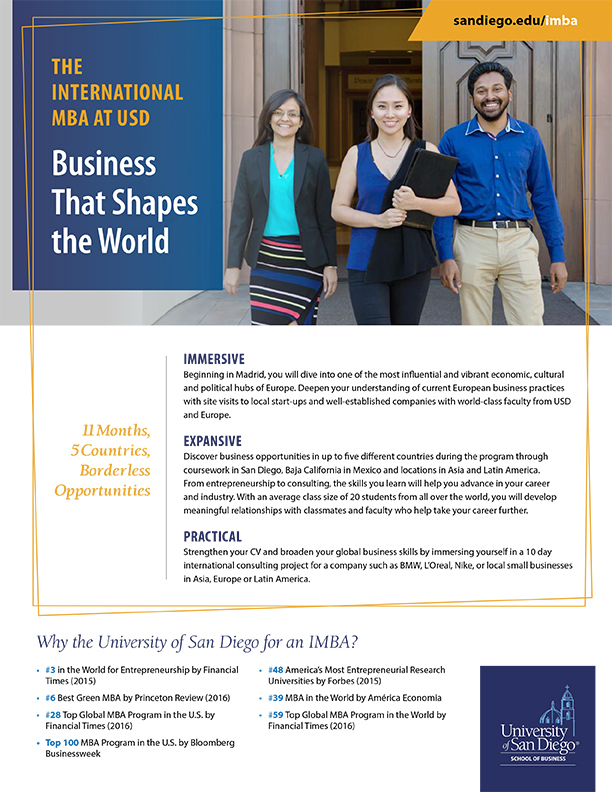 The International MBA program is USD’s first MBA program that provides professionals with the path to propel their careers forward while gaining valuable global business experience – and expanding their global business networks – in less than a year. Why Choose USD? Hear from IMBA alumna, Leonie Sandelbaum on why she choose the University of San Diego for her International MBA. Location: USD San Diego campus, USD Madrid Center, Mexico and two other international locations of choice.